A lot of people assume that being vegan must be really hard when it comes to eating and that I must spend a lot of my time craving the foods that I used to eat. The simple truth of it is that I still enjoy all of my favourite meals, the difference is that now they are all plant based. Are they lacking any flavour? Heck no! Part of the fun for me is in recreating my favourite dishes using only plant based ingredients. In sharing these recipes I allow the food to do the talking. An old favourite of mine is linguine in a creamy mushroom sauce. And here’s the recipe. Heat the oil over a medium heat. Add the mushrooms and toss making sure they are coated in the oil. Grate in the garlic and continue to cook. Cook the pasta to the packet instructions. Drain and rinse the cashews. Add to a food processor with half of the water and blend. Add in the rest of the water, bit at a time. This makes a really thick sauce so if you prefer a more watery consistency then just add more water. When the mushrooms have cooked turn up the heat and add the wine. Bring to the boil and then reduce heat to a simmer and cook until the liquid has reduced by half. Add the thyme and the cashew cream, stir well and add the nutritional yeast. Season well and add the pasta. Serve up and top with some vegan parmesan. During my recent visit to Assisi I devoured some amazing pizzas, senza formaggio of course. All of the restaurants that serve pizza have wood burning ovens so the bases are light and ultra crispy. It’s like pizza heaven. Since I’ve been back I’ve been craving pizza but I didn’t want a heavy, doughy base that would leave me feeling full and heavy. My sister’s been trying tortilla pizzas recently and raves about them so I thought I’d give it a go. There’s no going back; guilt free midweek pizzas have arrived at casa mia! Preheat the oven to 180°. Cut the tortillas into quarters and cook tortillas for 5 minutes. Add the tinned tomatoes to a pan along with the sundried tomatoes. Cook for about 20mins over a medium heat, until some of the water has evaporated. When ready blend the mix using a hand blender. Heat a little oil on a pan and cook the portobello mushrooms. Season with some salt when done. Cover the tortilla slices with some sauce and layer up the pizza with the toppings of your choice. Return to the oven and continue to cook for a further 10mins. Remove from the oven and add some vegan cream cheese and rocket. Finish with some chilli flakes. Growing up, I loved Bolognese but in our house it was almost exotic, we rarely had it until we were well into our teens and then, each time it was made, it was devoured by all. Sometimes Mam would have the special spaghetti dish ready for us when we got home from school for lunch. Needless to say after that massive feed very little attention was paid in class, we’d practically roll back to school for the afternoon. Although so much has changed since then and I no longer eat meat, I love this favourite dinner of my teens, the vegan version. In this recipe I recreate that dish, without the meat and without the pasta too. This is a lighter way to enjoy a bolognese, full of tomato flavour, you’ll want to lick the bowl, I did. This bolognese recipe is very similar to the one I’ve used for my Lentil Lasagne but it’s not as traditional. 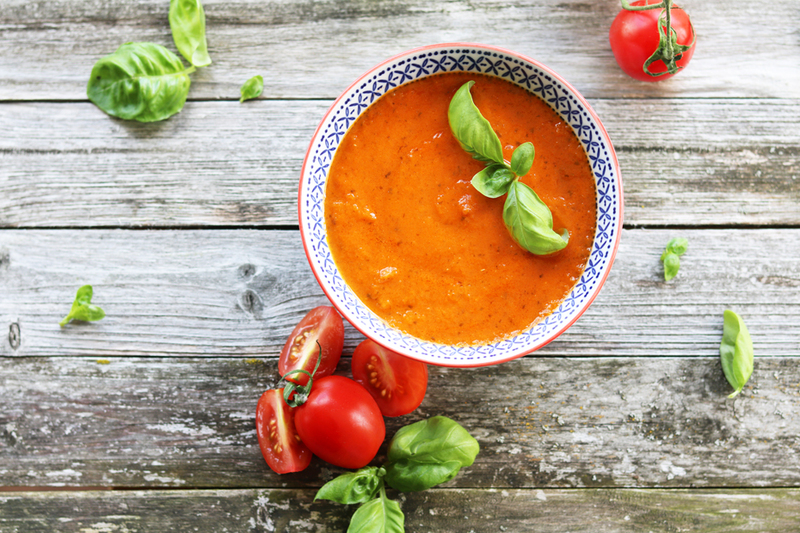 Another super easy recipe for Meatless Monday. You will need a spiralizer for the courgettes but they’re not that pricey and during the summer months you’ll get great use out of it for delicious salads. If not you can also use regular dry pasta. Heat some oil in a large pan and gently cook the onion until it has softened and is translucent. Add the lentils and give a good stir to coat them in the mix. Add the tomatoes, herbs and the water/stock and bring to the boil. When the liquid has reduced by 1/3 lower the heat and leave to simmer for about 30 minutes, until the lentils have cooked. Add a splash of soy sauce or tamari, salt and pepper to taste and remove the bay leaves before using the ragu. Spiralize some zucchini and either serve straight away or you can heat the zucchini through by tossing it on a hot pan. I love Italy, I love everything about it; the architecture, the language, the animated ways of communicating. But I especially love the rituals involved around eating in this stunning country. This naturally gluten free dish is one of the first that I cooked on a culinary trip to Lazio, a number of years ago. I guess you could call it a vegetarian lasagne that I’ve veganised. 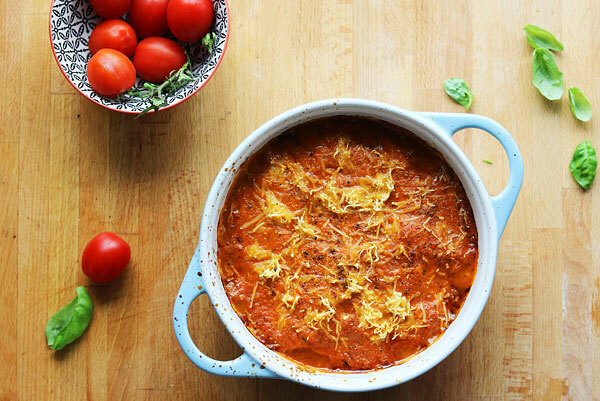 It’s hearty and meaty, its packed with flavour and it’s made in one pot! I’ve made a few changes to the construction of this dish as I found the layering-lasagne-type method difficult to serve up without it looking like mush on a plate. This new way takes a little more time but it looks so much better served up now so it’s worth it. If you have kids, get them on board with the making, it’s easy and fun! 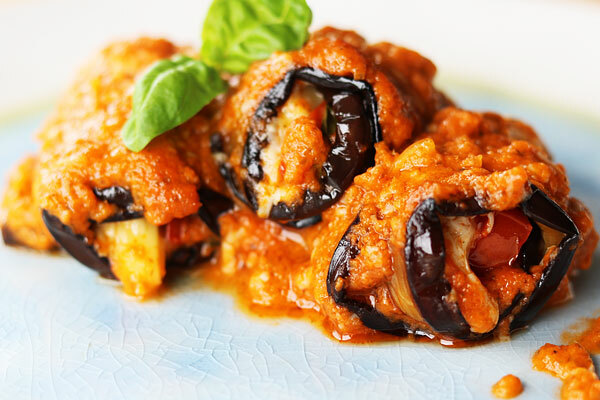 Involtini di Melanzane alla Parmigiana! Buonissima! Preheat your oven to 160°C. 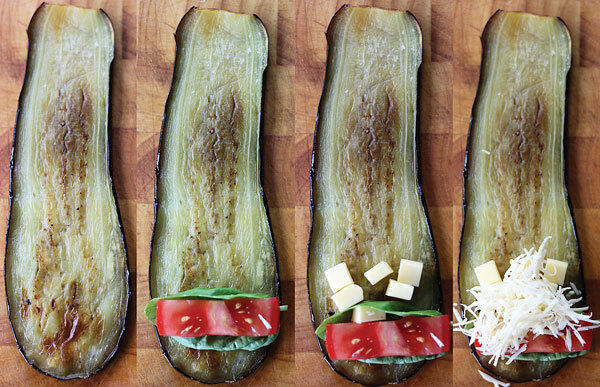 Cut the aubergines length ways into 0.5cm strips. 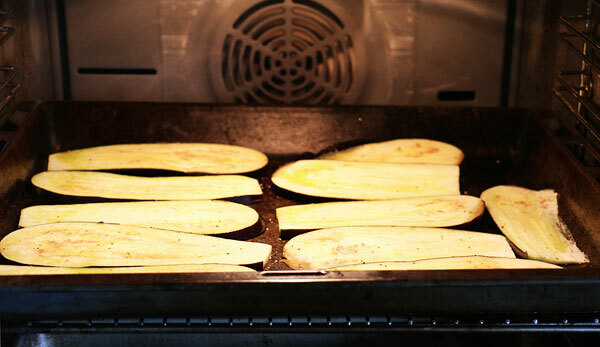 Brush a large oven tray with some olive oil and arrange the aubergine slices. Brush the tops of the aubergines with a little more olive oil and gently cook until they are soft. While the aubergines are cooking you can cut the tomatoes into 1cms lengths, dice the vegan pizza cheese and grate the vegan parmesan cheese so that you’re all set up for rolling. Remove the aubergines and allow to cool. 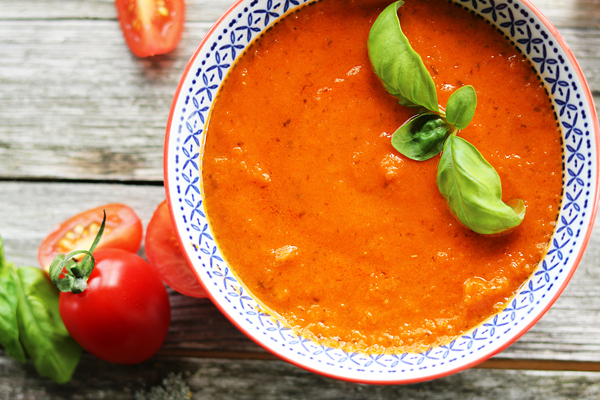 In the meantime spoon some of the basic tomato and basil sauce onto the bottom of a casserole dish. Now it’s time to make the rolls, gather up the kiddy troops and set each one a work station…or else you could just do it yourself. 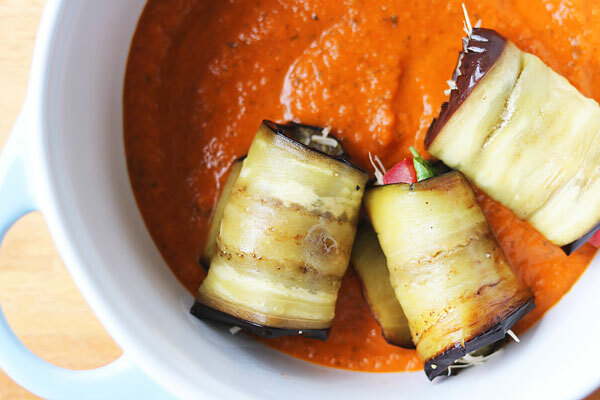 Lay each strip of aubergine down with the widest part closest to you. 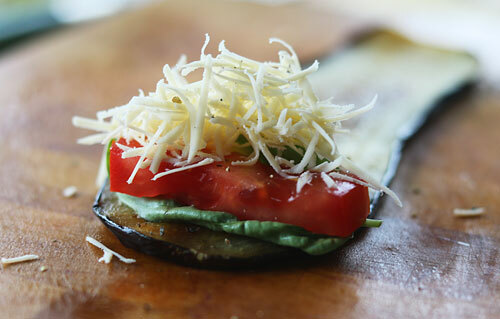 Place one basil leaf on top, followed by a slice of tomato, some cheese and season well with salt and pepper. 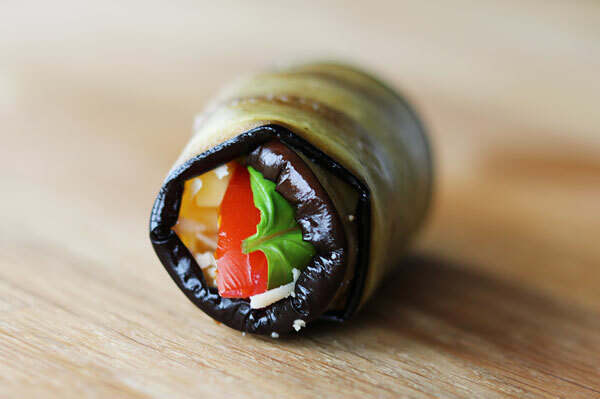 Now roll the aubergine strip away from you encasing the ingredients inside. Arrange in the casserole dish leaving a little space between each one. When the dish is full cover with more of the tomato and basil sauce and finish with some grated cheese. Place in the oven and cook at 180°C for about 30 minutes or until the top is golden. 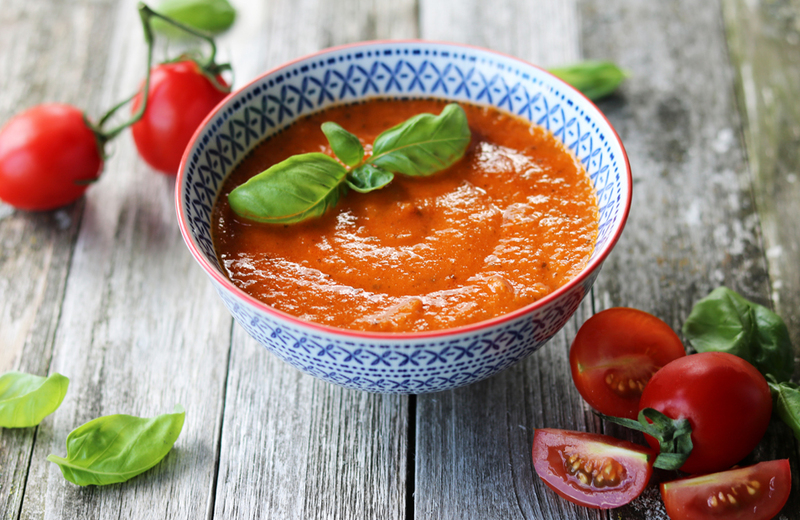 This simple sauce is packed with flavour and there are only three ingredients! 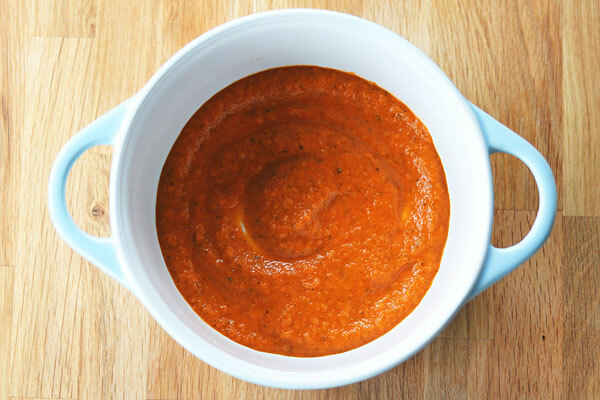 I use this sauce in many of my recipes throughout the blog. It’s great as a base for pizza and it’s the sauce that’s traditionally used in Melanzane alla Parmigiana (Aubergine with Parmesan). Add a little oil to a large pan and gently heat over a low flame. Add the onions and cook until they become translucent. Add the tinned tomatoes and give it a good stir. Chop your basil and add to the pot. Have a little taste and add some sugar if needed. Simmer on a low heat until the sauce becomes a beautiful, deep orange colour (approx 20mins). Using a hand blender give the sauce a good whizz to smoothen (the large pan comes in handy here as it can get a tad messy). And that’s it! Yum! You can use straight away or freeze. Top tip : divide the mixture into 6 freezer bags, each bag = sauce for one medium pizza!